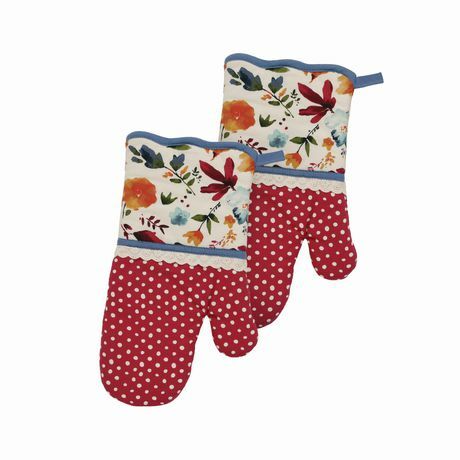 The Pioneer Woman Willow Oven Mitt 2-Pack adds a vintage-inspired touch to any farmhouse-style kitchen while keeping your hands safe from burns. The oven mitts feature an eyelet print in red and white, trimmed with a pretty floral print on white ground and finished with a scalloped edge. The set is made of 100 percent cotton and is machine washable for easy care. Found exclusively at Walmart and Walmart.com. Coordinate your Pioneer Woman kitchen set with matching kitchen towels, potholders, and table linens from the colletion (sold separately) to complete your kitchen decor with a country-chic look.